Tomorrow’s computers will run on light, and gold nanoparticle chains show much promise as light conductors. Now LMU scientists have demonstrated how tiny spots of silver could markedly reduce energy consumption in light-based computation. Today’s computers are faster and smaller than ever before. The latest generation of transistors will have structural features with dimensions of only 10 nanometers. If computers are to become even faster and at the same time more energy efficient at these minuscule scales, they will probably need to process information using light particles instead of electrons. This is referred to as “optical computing”. Fiber-optic networks already use light to transport data over long distances at high speed and with minimum loss. The diameters of the thinnest cables, however, are in the micrometer range, as the light waves -- with a wavelength of around one micrometer -- must be able to oscillate unhindered. In order to process data on a micro- or even nanochip, an entirely new system is therefore required. One possibility would be to conduct light signals via so-called plasmon oscillations. This involves a light particle (photon) exciting the electron cloud of a gold nanoparticle so that it starts oscillating. These waves then travel along a chain of nanoparticles at approximately 10% of the speed of light. This approach achieves two goals: nanometer-scale dimensions and enormous speed. What remains, however, is the energy consumption. In a chain composed purely of gold, this would be almost as high as in conventional transistors, due to the considerable heat development in the gold particles. Tim Liedl, Professor of Physics at LMU and PI at the cluster of excellence Nanosystems Initiative Munich (NIM), together with colleagues from Ohio University, has now published an article in the journal Nature Physics, which describes how silver nanoparticles can significantly reduce the energy consumption. 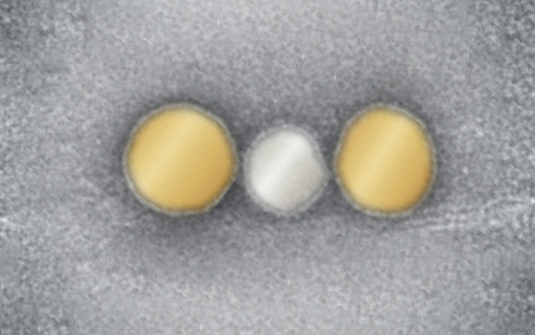 The physicists built a sort of miniature test track with a length of around 100 nanometers, composed of three nanoparticles: one gold nanoparticle at each end, with a silver nanoparticle right in the middle. The decisive precondition for the experiments was the fact that Tim Liedl and his colleagues are experts in the exquisitely exact placement of nanostructures. This is done by the DNA origami method, which allows different crystalline nanoparticles to be placed at precisely defined nanodistances from each other. Similar experiments had previously been conducted using conventional lithography techniques. However, these do not provide the required spatial precision, in particular where different types of metals are involved.